Embryonic stem cell (ESC) research is at the frontier of modern medicine. It offers the potential for lifesaving new treatments, possibly cures, for devastating diseases and at the same time challenges us to consider difficult questions about the earliest stages of human life and what kind of limits should be imposed on research in pursuit of medical advances. There is no question that embryonic stem cells have enormous potential to ease suffering and save lives. They have the ability to generate virtually any kind of tissue as well as coordinate repair processes within the body. If we can determine how these cells function and how to guide their production of functional cells, the potential benefits are almost unimaginable. On the other hand, these cells are found only in the earliest stages of human development, and generation of new lines of cells, using current technology, requires the destruction of a human embryo. Opponents of all research on human embryonic stem cells consider the blastocyst, the early-stage embryo from which these undifferentiated cells are derived, to be a human life and object to its destruction. However, most blastocyst sources of embryonic stem cells are from in vitro fertilization (IVF) clinics, where embryos that have not been implanted are routinely destroyed or indefinitely frozen. A survey of couples with embryos frozen for more than two years showed that 44% preferred indefinite storage of embryos, 21% opted for donation to research, and 34% preferred that their embryos be discarded. These data highlight the wide range of public opinion regarding the ethical boundaries in use of human embryos in research. In an attempt to address conflicting priorities and opinions surrounding this research, President Bush placed tight restrictions on federally funded ESC work in 2001, limiting scientists who receive federal money to work only with an established set of 64 cell lines. The federally approved cell lines were all obtained from embryos left over from IVF procedures prior to August 4, 2001, the date of the new policy’s implementation. Federal money cannot be used for projects that involve derivation of new stem cell lines, even from embryos that would otherwise be destroyed. However, the new policy does not restrict privately funded work, and studies involving the derivation of new stem cell lines, and use of those cells for many different types of research, continue in many areas of the United States and internationally. In California, a groundswell of public support led to passage of Proposition 71, a remarkable measure allocating $3 billion in state money for research using new human ESC lines. Other U.S. institutions have used private money and facilities to derive new lines, and many states are considering measures similar to California’s, which allows scientists to work outside the federal restrictions. Meanwhile, scientists working in institutions that receive federal grants are left with older, suboptimal ESC lines. Since the president’s announcement, it has become clear that many of the 64 “established” lines are not really established at all. Many are simply not viable, and others will not grow in the lab. For example, the six lines derived at Sweden’s Karolinska Institute all failed to expand in culture and cannot be used. Other approved lines sustained chromosomal damage during their cultivation, meaning that they are not true copies of the original stem cells and are basically tumors. These cells continue to divide but their growth may be uncontrollable, and their tumor-like behavior precludes use in a clinical setting. In the midst of this turbulent situation, Emory and Georgia Tech have agreed to support a core facility for human embryonic stem cell cultivation. The goal of this facility is to provide researchers on both campuses with high-quality cells as they explore new treatments. We made the decision to use only lines approved by the federal government for federally funded work to avoid jeopardizing the federal funding of our colleagues. Nonetheless, we recognize that the approved lines are clearly unsuited for many applications, and the decision to use them is a compromise to balance science with political constraints. Furthermore, the initial research in the core will be directed at methods to prevent chromosomal mutations in the cell lines and maximize their utility for ongoing studies. As a society, we must address the complex ethical dilemmas posed by stem cell technologies. Despite the 2001 decision, scientists funded outside the NIH continue to make progress with new lines, forging a path toward application of the cells in the clinic. will be suitable for transplantation into patients. New lines will be needed. Sooner or later, institutional review boards that oversee any new experimental treatments in humans will be forced to weigh the individual and societal benefit of stem cell research and therapy versus its risks, both medical and ethical. Some regulation of the process of derivation, cultivation, and use of human embryonic stem cells is certainly warranted. Well-accepted regulations covering patient privacy and the safety of clinical research protocols serve as a basis for developing similar standards to regulate the appropriate derivation and use of these cells. As recommended by the National Academy of Sciences, the Emory/Georgia Tech core facility will be overseen by an advisory board. In my opinion, current restrictions should be replaced by enforceable standards for both the precise sources of embryos to be used and the circumstances under which obtaining them would be permissible. The standards would include specific limits on which embryos could be used. For example, those that could conceivably be implanted should not be used. The rules must also specify strict privacy for donors and their genetic information and establish a clear consent process for donation of embryos for this research. Proponents of deriving new stem cell lines suggest that blastocysts—particularly those created outside a woman’s body for the purpose of assisted reproduction—are equivalent to brain dead donors of solid organs. Federally established standards regulating organ donation have served the transplant community well and are a credible model for an embryo donation consent process. Here at Emory and at Georgia Tech, we are committed to supporting the best research possible within the existing legal framework. By improving the capabilities of the existing cell lines, we aim to help publicly funded research in this area reach its fullest potential. At the same time, we must participate in the larger public dialogue over the direction of stem cell research, to ensure that its great potential is realized. 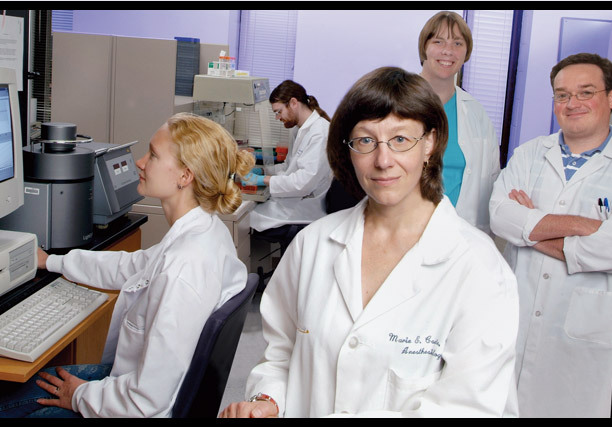 Marie Csete is assistant professor of cell biology and the John E. Steinhaus Professor of Anesthesiology in the School of Medicine.